A mysterious new partnership between Indonesia’s spy agency and Investment Coordinating Board (BKPM) to boost foreign investment has civil society wary of deepening agrarian conflict in the post-authoritarian country. As per an agreement the two institutions struck in March, the State Intelligence Agency (BIN) will begin compiling data for investors on the business climates of specific regions — data on which the BKPM often lacks “accurate information,” BKPM chief Franky Sibarani announced after the signing. Outgoing BIN head Marciano Norman added that such information would include data on local sympathies and grievances toward proposed projects. Riyatno, the BKPM’s head of legal assistance, told Mongabay the partnership was meant to “ensure a smooth process for firms granted business licenses, so that if a problem arises, a solution can quickly be found.” He declined to elaborate on what kinds of problems might be forestalled by working with the BIN, but said similarly aimed agreements already existed with agencies in charge of taxation, customs and statistics, among others. While little is known about the specifics of the new arrangement, activists point to Indonesia’s long history of repression by state security forces — before and after the 1998 fall of the dictator Suharto — to warn that intelligence reports on local sentiment could be manipulated to stymie community opposition to development projects. Ning Fitri, executive director of the Indonesian Forum for the Environment’s (Walhi) Central Java branch, said the long history in Indonesia of company-hired “spies” being used to sway opinion at contested sites meant the new agreement was cause for alarm. The BIN-BKPM agreement, Ning added, marked the first time government had formally enlisted in the effort. Aan Wijaya, an activist fighting against a cement mine in Rembang, Central Java, said that after anti-investment leaders were identified in his village by company-hired spies, preman were paid to intimidate them at their homes. Sometimes, preman receive police protection. In Kulon Progo regency, Yogyakarta — the site of a long-running conflict over a coastal iron mine — police were caught on film forming a protective ring around dozens of preman as they burned 12 village guard posts to the ground. Runaway land conflict might seem an ineluctable fact of life in a country where powerful investment interests mix with poor land titling and overlapping zoning authority. But the scale of the problem today — with thousands of communities involved in conflict with companies, the state or each other, according to government estimates — not only imperils nearly a million households and stains new President Joko “Jokowi” Widodo’s populist credentials: It is a big thorn in the side of Jokowi’s plan to double foreign investment for his grand infrastructure push. Ning Fitri criticized the principle license system for giving investors a foothold on what might be contested land. The system, she argued, allows firms to start acquiring the rights to plots piecemeal, often through fraudulent means, well before a project’s viability has been established, thus sowing conflict. Riyatno declined to say whether the new agreement was an effort to curtail agrarian conflict, but since land disputes are a chief impediment to investment in Indonesia, it’s safe to say doing so is at least one of its aims. Carlo Nainggolan, head of the environmental department at Sawit Watch, a local NGO that monitors Indonesian palm oil — expansion of the crop is linked to half of Indonesia’s land disputes, government statistics show — said the BIN-BKPM agreement would likely exacerbate agrarian conflict, not alleviate it. “There’s going to be more disputes, because the (agreement) permits the state security apparatus to involve themselves in land conflicts to protect concessions,” he said. Rendi Witular, managing editor at the Jakarta Post, doubted that BIN spies would significantly influence the outcomes at conflict sites, given the agents’ limited numbers and questionable competence. Indeed, the malefactions of the Indonesian security apparatus was the subject of a 2014 year-end survey of land conflicts by the Jakarta-based Consortium of Agrarian Reform (KPA). The survey highlighted a host of rights violations, including 19 deaths, in 417 agrarian conflicts where security forces got involved. 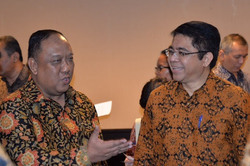 Masinton Pasribu, a legislator from Jokowi’s Indonesian Democratic Party of Struggle (PDI-P), publicly supported the study’s conclusions and backed the KPA’s call to remove the security forces from the agrarian theater. Iwan Nurdin, the KPA’s secretary-general, said that even by its own logic, the BIN-BKPM agreement was unlikely to buoy investor confidence. “I think it actually is a negative, as it makes investors wonder: Is it possible to invest in Indonesia without committing human rights violations? It signals to investors that there is something wrong with the investment board,” he said. According to Iwan, covert strategies will only make it easier for firms to carry out “land grabs,” making it harder to resolve land conflicts that incapacitate development and uproot families.